The theory is that if you take in non-alcohol calories with alcohol, your body absorbs the alcohol at a slower rate. It’s already getting energy from the sugars. 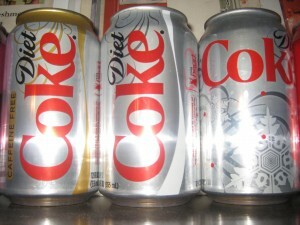 Aspartame has no calories available to the body, so it’s like it’s not there. Therefore, if you have a “diet” jack and coke, you will your buzz a little faster than a “classic” jack and coke. It won’t be faster than drinking your bourbon neat. Also, aspartame is probably poison you should never put in your body. A new study found that mixing alcohol with a diet soda results in higher (BrAC) Breath Alcohol Concentrations than mixing it with normal soda.